Dr Boromand was born on 17 March 1973 in Isfahan, Iran. He was brought up in a well-educated family. His father was one of the most famous doctors in the city. Peyman followed his father’s profession and became a doctor. Dr Boromand was graduated from medical school and finished his secondary study in Ear, Nose and Throat (ENT). Then he started his specialty education in the field of Ear, Nose and Throat (ENT) in the University of Tehran, the first-rank university in Iran, and received his board certification. During his study, He conducted many researches about ear, nose and throat and especially cosmetic surgery. Dr Boromand is the member of The European Academy of Facial Plastic Surgery (EAFPS). 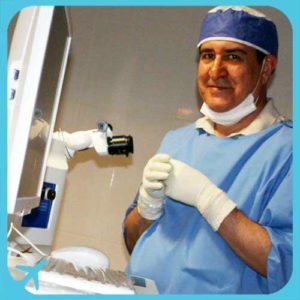 He is one of the most famous Rhinoplasty surgeons in Iran. He has been to other many countries such as the United Kingdom, South Korea, France, UAE, Portugal, and African countries to learn from some of the leading surgeons in the field of Rhinoplasty and benefit from their techniques and experience. He has 15 years of experience as an ENT (Ear, Nose and Throat) specialist and plastic surgeon. His main focus has been on Rhinoplasty and Plastic surgery. Up to the present, he has performed more than 5000 surgeries.